MACEDONIA CONDEMNS KOSOVO ALBANIAN TERRORISTS. SKOPJE, Feb 28 (Reuters) - Macedonia said on Wednesday it hoped international diplomatic efforts would stop violence on its border it said was being provoked by ethnic Albanian fighters. But it said it would retaliate if forced to do so. "If the international community does not join Macedonia in overcoming violence, a division of the Balkans on religious grounds will be provoked due to Macedonia's geo-strategic position, which will seriously affect Europe," Defence Minister Ljuben Paunovski told Reuters in an interview. He was echoing international concerns of a looming new Balkan crisis, given that ethnic Albanians comprise a third of Macedonia's two million population and have had sometimes tense relations with the majority Slavs. A two-hour gunbattle between Macedonian security forces and terrorists at the Macedonian village of Tanusevci on the border with Kosovo two days ago prompted President Boris Trajkovski to seek support from the United Nations and NATO for a crackdown. "The armed group is using the village as a base and our security forces can take them out very quickly. But first we have to use all political and diplomatic means to solve the situation," Paunovski said as reports of new shootings came in. A NATO delegation arrived in Macedonia on Wednesday and went straight into crisis talks with Macedonian officials. Paunovski said Macedonia's plan of action did not include crossing the border into Kosovo. "If there is action, we will go only to the border, we must stop there. 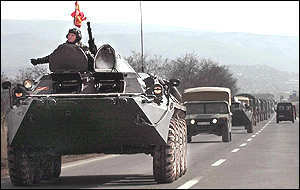 But any action will be coordinated with KFOR (NATO-led peace force in Kosovo)," Paunovski said. He said Macedonian forces had shown extreme restraint an effort to prevent an outbreak of a local inter-ethnic conflict. Paunovski said the armed group of ethnic-Albanians had support from the other side of the border and were connected with other armed groups in Kosovo, some of which he said were involved in contraband and crime. Skopje signed a long-delayed border demarcation agreement with Belgrade last week, which officials said would curb a flourishing smuggling businesses in the area in the long term. Paunovski welcomed statements from ethnic Albanian political parties in Macedonia and Kosovo expressing support for a diplomatic solution to the crisis. He strongly rejected reports of harassment of villagers by Macedonian forces and accused the ethnic Albanian fighters of driving the villagers away to escalate violence. Macedonian Prime Minister Ljubco Georgievski said earlier he had received unconfirmed reports that Albanian guerrillas were holding residents of Tanusevci as hostages to prevent the Macedonian forces from taking control of the village. Paunovski said the reports were hard to corroborate since the army and police had not set foot in the village for a week. "We cannot go there to check, because any attempt to check the village for civilians will mean armed conflict with the terrorists. That is the biggest dilemma," he said.